LR Weapons brings you a big surprise this month. Their new product is featured at the Secret Affair and it is... Yes, you would have never guess, a Fishing Rod name Gone Fishing! Before we even go into the rod itself, lets take a look at the HUD that comes with it and you can start to imagine how many variations of colors you can have with the rod and you get to easily resize and change it anytime you like with the HUD and as often as you want to! The Rod, Handle and Wire as well as the wraps comes in a variety of colors for you to choose from. 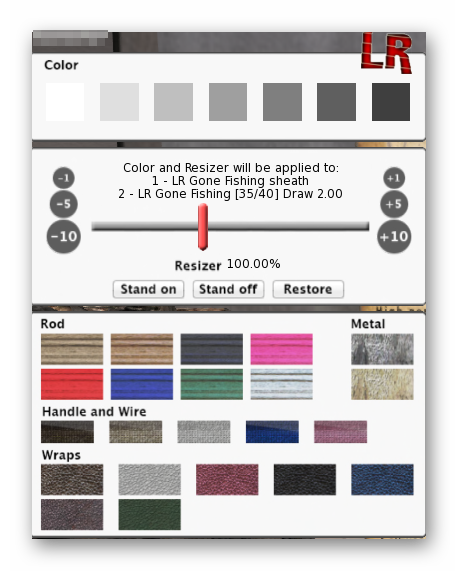 The first thing you will notice about the Rod is that there are a lot of colors and you can even customize the size to fit your avatar. This Pink/Blue color scheme is one of Kitty's favorite which is more feminine and it really makes the whole fishing experience more cute. But there is more! You actually get a set of LR Divian Bracers to go with this purchase and it comes with its own HUD for resizing as well as coloring it in various colors. The Violet Bracers is pretty on Kitty don't you think? When sheathed, the Gone Fishing Rod fits nicely on your shoulder. The Rod also comes in 2 damage mode in RP - Sword and Slave which ever is more applicable, so there is a choice.